Frequency: 1 issue per year. Museum Worlds: Advances in Research is a new, multi-disciplinary, refereed, annual journal from Berghahn Journals that will publish work that significantly advances knowledge of global trends, case studies and theory relevant to museum practice and scholarship around the world. Responding to the need for a rigorous, in-depth review of current work in the broad field of Museum Studies, Museum Worlds: Advances in Research will contribute to the ongoing formation of Museum Studies, as an academic and practical field of research which is rapidly expanding and alive with potential, opportunity and challenge that parallels the rapid growth of museums in just about every part of the world. 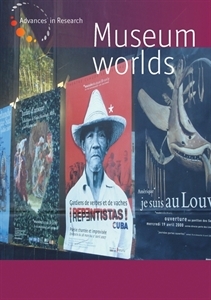 Museum Worlds: Advances in Research aims to trace and comment on major regional, theoretical, methodological and topical themes and debates, and encourage comparison of museum theories, practices, and developments in different global settings. Each issue includes a conversation piece on a current topic, as well as peer reviewed scholarly articles and review articles, book and exhibition reviews, and news on developments in museum studies and related curricula in different parts of the world. Drawing on the expertise and networks of a global Editorial Board of senior scholars and museum practit ioners, the journal will both challenge and develop the core concepts that link different disciplinary perspectives on museums by bringing new voices into ongoing debates and discussions. Articles will be of exceptional quality and general interest from around the world.